Best Seller is a Grainger 1250 listed exclusively for sale with YOTI. 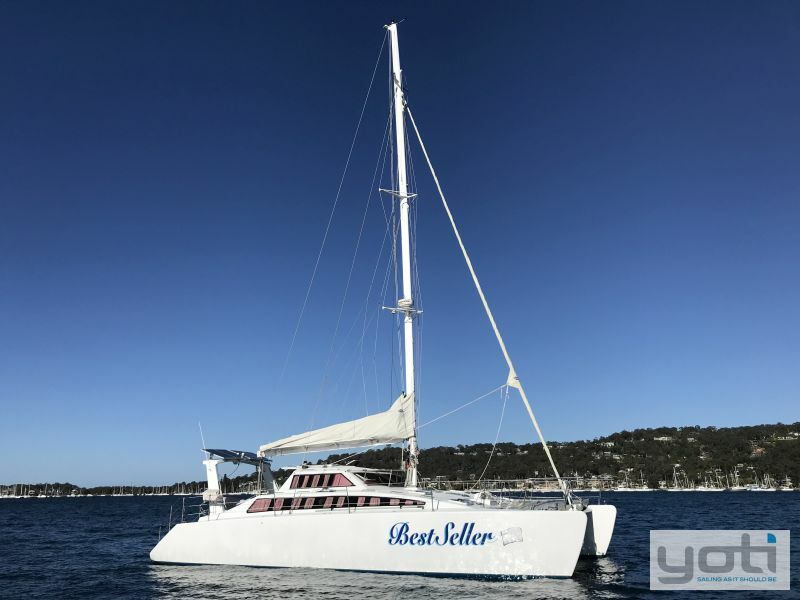 Completed and launched in 1996, Best Seller presents a seriously well updated and professionally maintained big volume cruising catamaran which is a rarity in this price bracket. 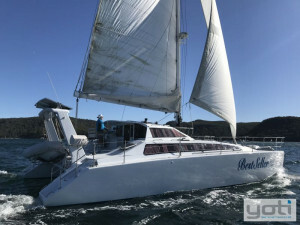 The rig (mast) and all standing rigging were installed new in 2010 along with a new mainsail and furling genoa. Most running rigging was replaced in 2015. Impressively and importantly, the Volvo D1-30 engines were installed new in just 2011 with folding propellers. Access from the water or dock is simple and safe from the generously sloping transom stairways. The decks are clear and uncluttered. The Targa / davit system with solar panels and dinghy storage would be the envy of much later model catamarans. 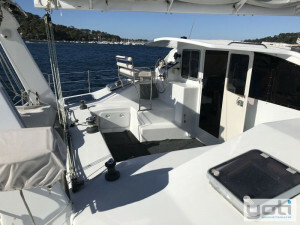 The cockpit is well protected yet with great visibility and includes a comfortable elevated helm seat which actually allows you to see where you're sailing. 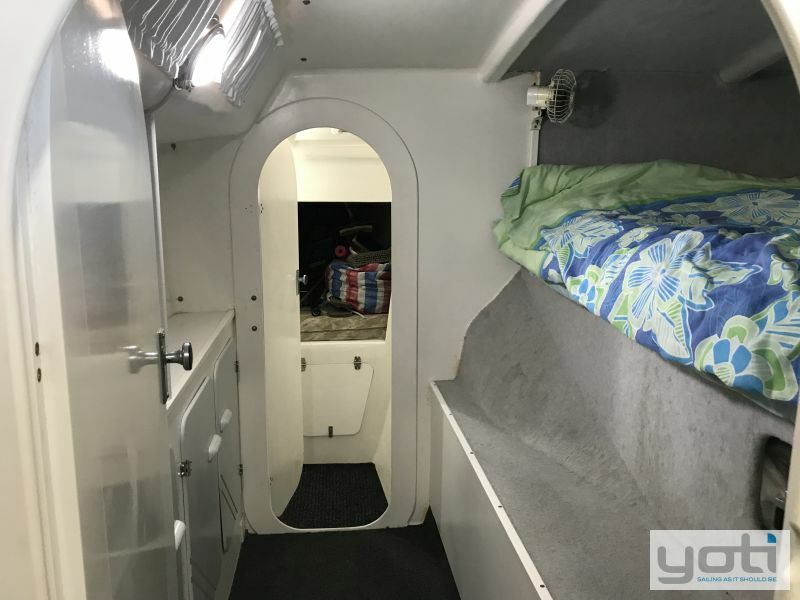 Big storage lockers are accessed from the foredeck. 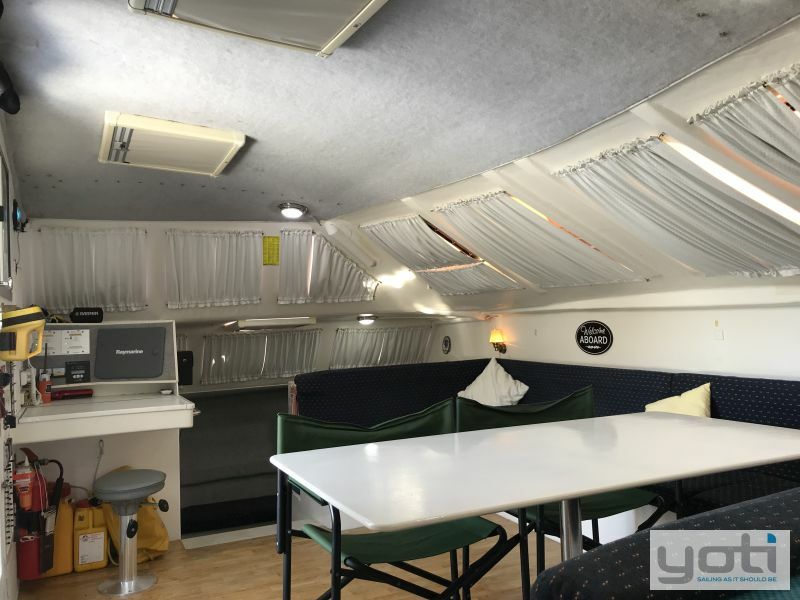 Internally the saloon is large and simple with U shaped seating which allows the big table to be set to one side. 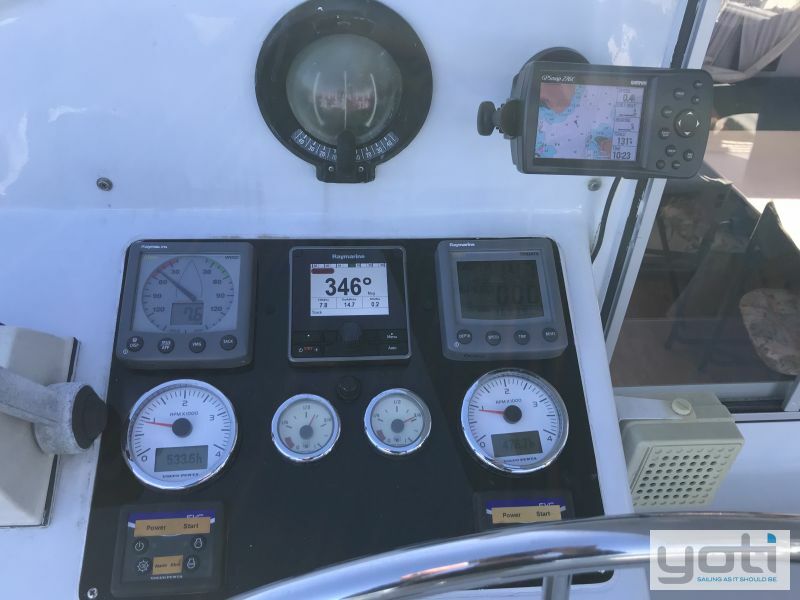 A dedicated nav station features updated Raymarine electronics. The port or owners hull features the larger of the two head / shower rooms which sits aft. A central storage / seating area then leads to the owners Queen berth which then leads further to another storage area or single cabin. The starboard hull includes a double cabin aft with engine access (a cabin easily used for storage and / or a workshop. The big in-line galley is central and within easy passing distance to the saloon table and is a very light bright area thanks to the windows. 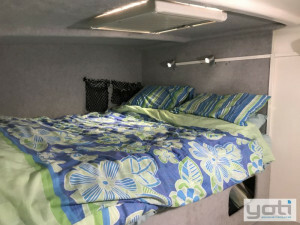 Further forward is a second Queen guest cabin and finally the second head / shower. 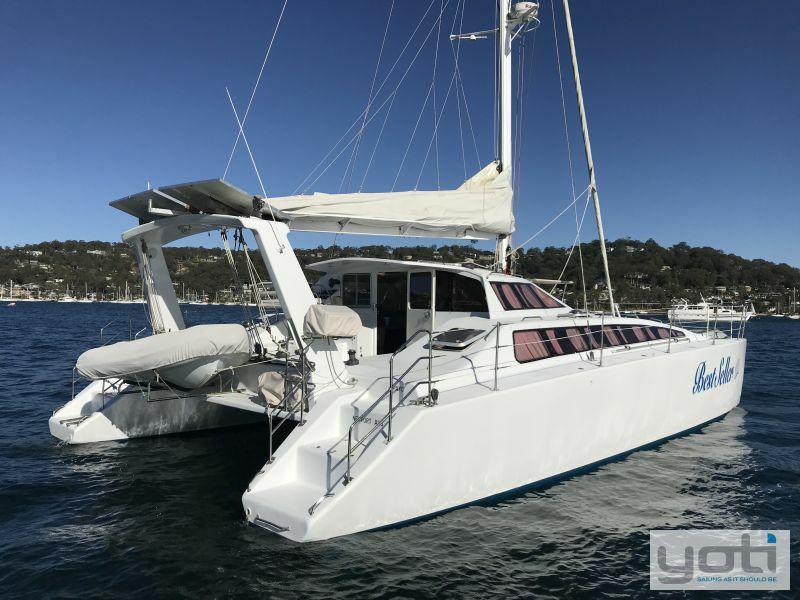 Best Seller's owners have used the catamaran for exactly what she was designed - comfortable extended periods of East Coast cruising. Anti-fouled in May 2018, Best Seller is ready and available for inspection at Bobbin Head in Sydney's North. Contact Peter Mactier for further details. Engine Room : Engine 1 accessed via large hatch forward of transom stairs. Engine 2 accessed via aft cabin. Number of Batteries : 2 x engine start batteries 100AH, 660CCA AMG (new 2009). 5 x house 120AH Full River AGM deep cycle house batteries (new 2009) secured by S/S brackets. Number of Fuel Tanks : 2 x 180L Wrenco poly type tanks (new 2009) - 360L total. 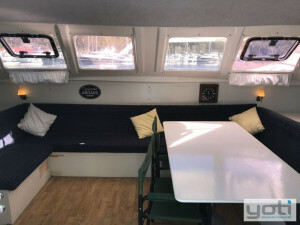 Accomodation Notes : Large 'U' shaped saloon seating with table to starboard, nav station to port. 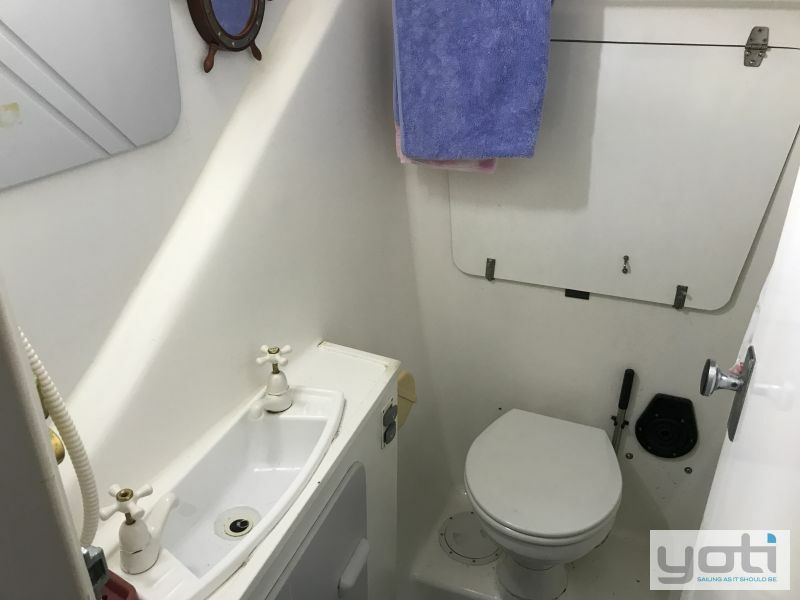 Port hull: Large head and shower aft, storage and seating area mid, owners Queen cabin forward plus additional storage or single enclosed cabin further forward, with sail storage below bunk. Starboard hull: Double cabin aft with engine access, large in-line galley mid, second Queen cabin forward and head and shower further forward. Large sail locker forward. 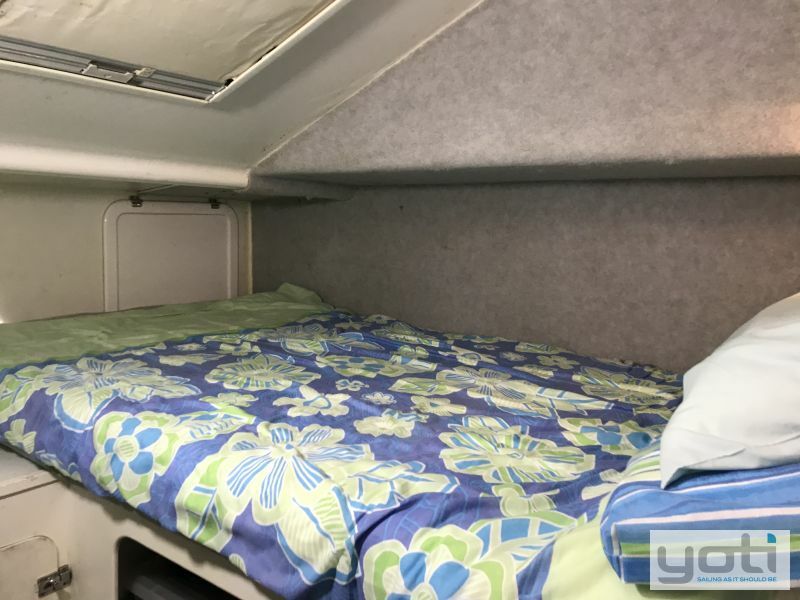 Two Queen cabins, one double cabin. Number of Berths : 7 + saloon. Number of Showers : 2 x water saver showers internal plus transom shower. Shower Type : Pressurised H&C water with 40L HW tank heated by engine or 240V shore power. 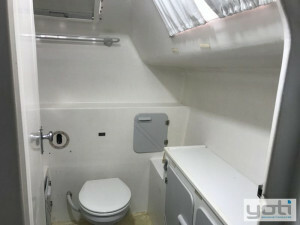 Number of Toilets : 2 x electric marine heads, 150L holding tank on port side with macerator. Galley Notes : Toaster, electric jug, heater, 3 x cabin fans. 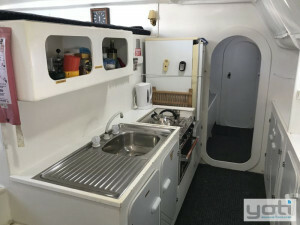 Various galley utensils including pots, pans, cutlery, mugs. Stove : Broadwater 2 burner stove and oven. Refrigeration : Kelvinator Fridge 130L. Number of Freezers : Vitrifrigo Freezer. Number of Sinks : S/S sink with draining rack. Entertainment and Appliances Notes : 15" flat screen TV/DVD with digital set top box. Sony stereo with 2 internal and 4 external waterproof speakers. 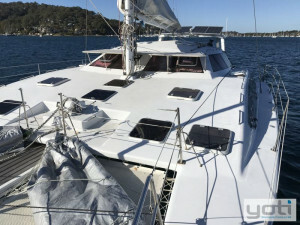 Anchor / Winch : Muir Cheetah HR1600 anchor winch (refurbished 2008). Bilge Pump : Electrical - auto pumps with alarms to all bilges. 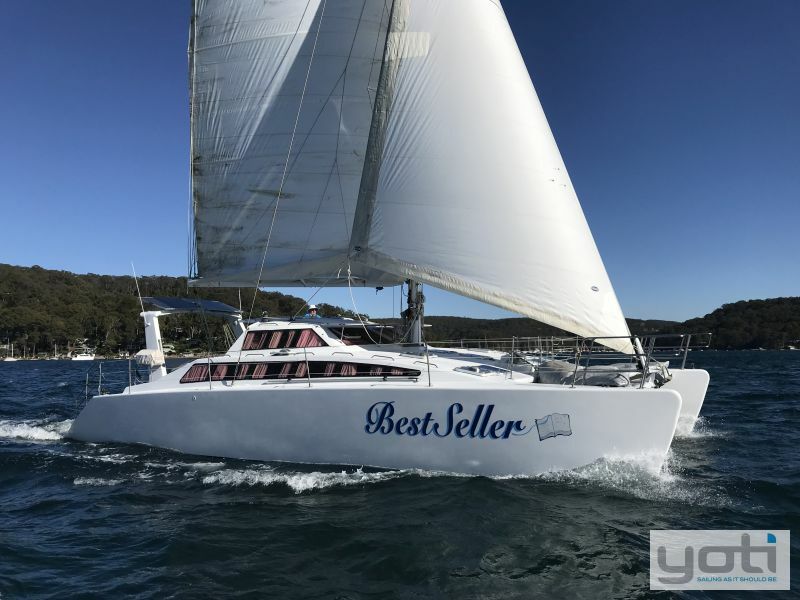 Deck Gear : Harken 48 2Sp ST main sheet winch, 2 x Harken 40 2Sp ST winches for traveller and multi purpose, 2 x Harken 48 2Sp ST Genoa winches on coachroof, 3 x Harken 40 2Sp ST winches on mast. Harken traveller and cars. Spinlock clutches. Mast/Rigging : Whalespars mast new 2010. Alloy painted finish boom, new 2010. S/S rigging new 2010. All running rigging new 2015. 2 swept back spreaders. Stainless steel chain plates bolted through partial bulkhead. Sail Inventory : Mainsail (new 2010) fully battened with batten cars with lazy jacks and boom bag. 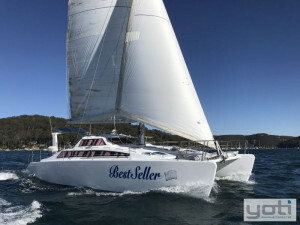 Furling headsail (new 2010). MPS with sock. Red and white small spinnaker. Storm jib. Harken furler. Electrics : AC/DC switchboard for Ship/Shore Inverter operation with circuit breakers. Inverter/Charger Frew Marine. Blue Sky Solar SB2512ix IPN-Pro Temp Probe solar charge regulator x 2.4 x 85Watt Kyocera solar panels mounted on Targa on swivel mounts. 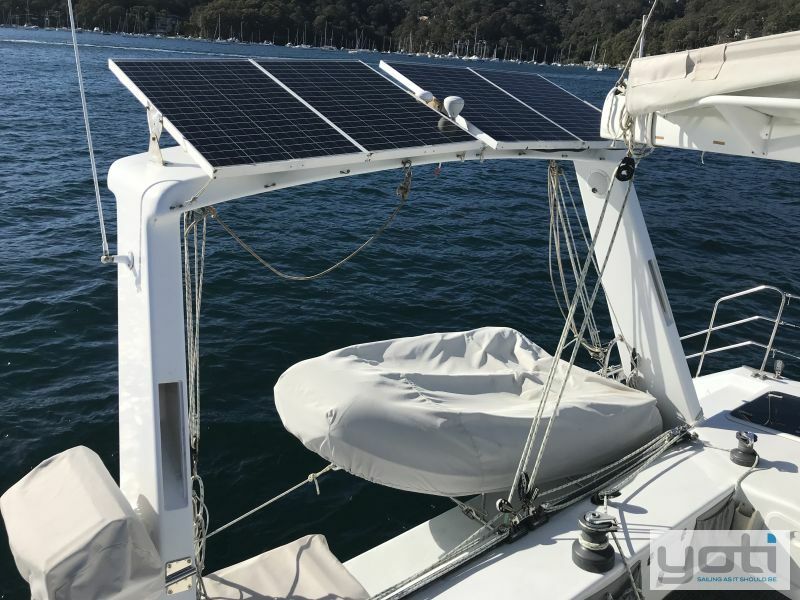 Air Marine 12V wind generator mounted on S/S bracket and pole on Targa with internal stop switch plus ammeter (currently not mounted. Refurbished with new blades and bearings 2009). All circular interior lights updated to LED. Nav lights. Electronics Navigation : Raymarine C120 colour chart plotter at nav station multi purpose GPS/AIS/Fish finder/RADAR/Instrument data with Navionics Gold Australia electronic charts. 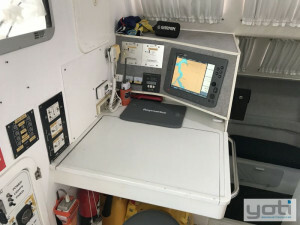 Garmin GPS chart plotter (2009) with mounting bracket, charger, aerial and cables (USB to PC, Power). Smart GPS receiver/antenna on Targa bar. 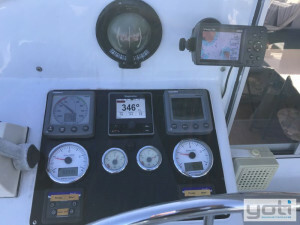 Raymarine ST60 multi speed / log at helm. 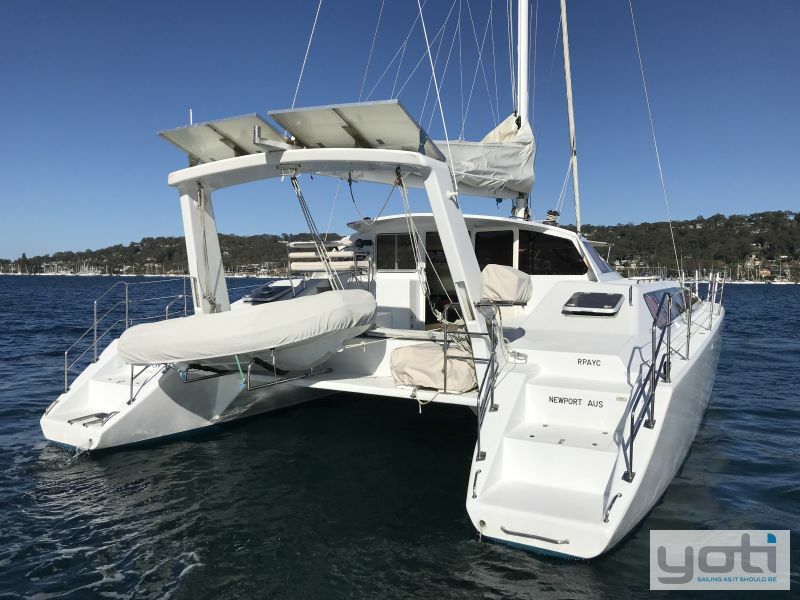 Raymarine ST60 analogue and digital wind instrument at helm. Raymarine RADAR (2010) - 24KM range with mast mounted scanner. Raymarine Evolution auto-pilot with hydraulic pump, fluxgate compass and rudder sensor - control unit at helm. Compass on bulkhead. Dinghy : Inflatable Zodiac Yachtline 285. Inflatable Sirocco 2.4m RIB. Tohatsu 5hp outboard with bulkhead bracket. Spare 3hp outboard. Safety Gear : Force 10 parachute sea anchor 20 m bridle & 100m x 16mm nylon rope. 4 x inflatable life jackets, 4 x PFD type 1, Coastal 8 x PFD Type 1, Burke 6 x PFD type 2. 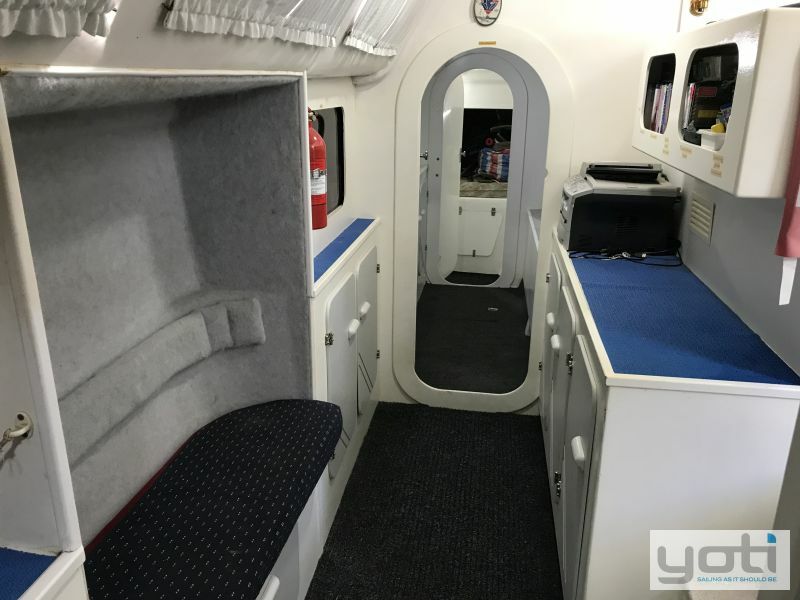 RFD 8 Sea Sava Plus life raft and base with hydrostatic release (last service April 2015). Bosuns chair. Yellow safety buoy. 2 x Polyprop liferings with auto-lights. 6 x fire extinguishers (require checking). 2 x fire blankets. 8 x safety harnesses. High pressure fire hose 20mx19mm. 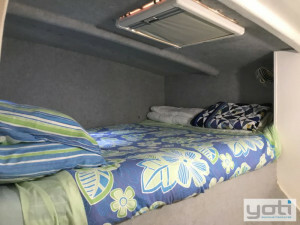 Covers : Canvas awning 5m x 3m, grey mesh window shades, white canvas window covers, instrument cover. Ground Tackle : Sarca 20kg anchor with 75m x 10mm short link chain and swivel. Rolla plough 25kg and 90 metre 10mm galvanised chain. CQR 60lb with 50m x 8mm chain. Danforth 36lb with 75m x 18mm nylon anchor rode. Bridle with S/S hook. Radio : VHF Radio Icom IC-M304 DSC capable (2009). VHF Radio portable IC-M33 (2009). VHF Radio portable GME GX560.27Mhz Radio GME GX2. Remarks : Gallemate 1100 marine S/S BBQ fitted 2015 with cover. 4 x 9kg gas bottles with S/S hold down bracket, gas regulator and solenoid switch. Gas detector control unit with 3 x gas detectors Mooring lines. 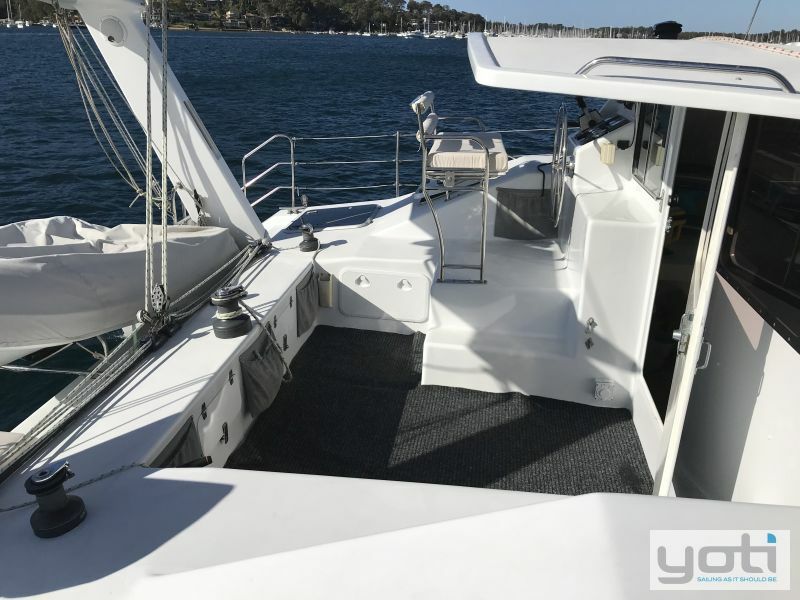 4 x large fenders, 3 x small fenders, Deck re-painted 2015. Hull re-painted 2016. Navigation equipment - Sextant, dividers, rulers etc. Copies equipment manuals. Various paper charts. 3 x chart books. 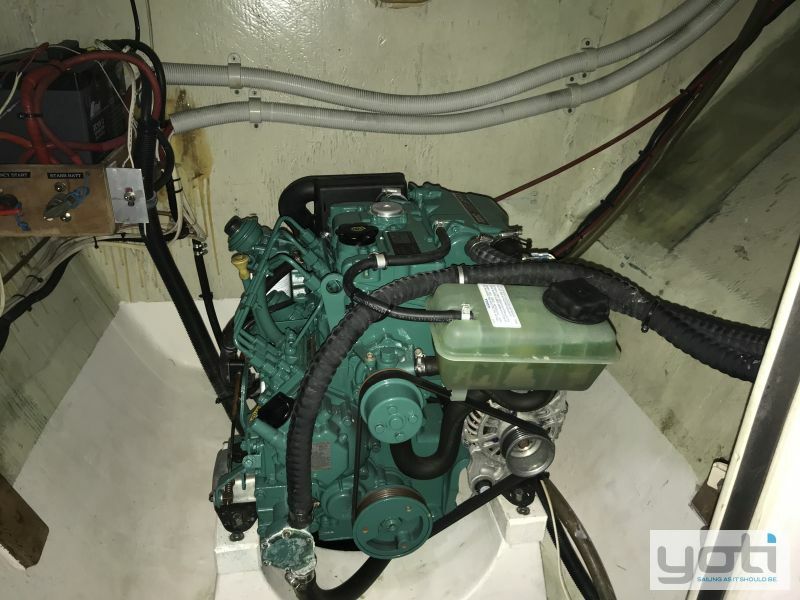 Various spares - electrical, plumbing, mechanical, sails/rigging, hydraulic steering. Anti-foul : Professionally anti-fouled May 2018. Steering : Hy-Drive hydraulic steering, 30" S/S wheel.